Solita's economy comes from fishing which is natural or by fish farming. This municipality is recognized by its fertile meadows and plains, the inhabitants of Solita love as a treasure their beautiful llaneros sunsets where the singing of birds and The colors of the jungle remind them of the biodiversity of a temperate climate that allows the constant navigation of the Caquetá River. Solita borders to the north with the municipality of Valparaíso. Starting from the birth of the Mononguete gully. to the south with the Department of Putumayo. Starting from the mouth of the Mononguete ravine in the Caquetá river, it continues along this river upstream to the mouth of the Canelo gorge, right bank of the Solita and Curillo municipalities and the Putumayo department. To the east with the Municipality of Solano. 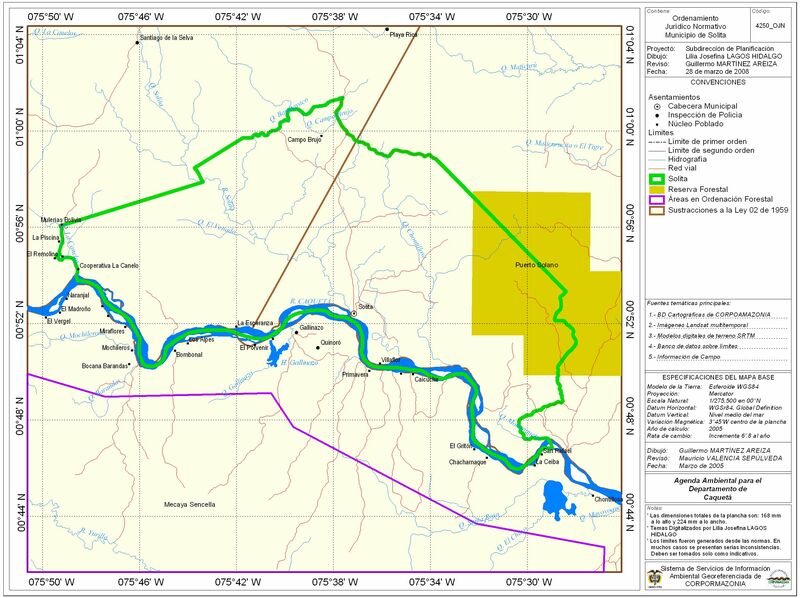 Starting from the birth of the Mononguete gully; By this water down to its mouth in the river Caquetá, place of contest of the municipality of Solano and the Department of Putumayo. And to the west with the Municipality of Currillo. Starting from the village of Puerto Bolivia (Mulerías) located on the left bank of the La Canelo gorge, - a contest site of the Municipalities of Currillo, Valparaíso and Solita, it is followed by these downstream to the mouth of the Caquetá River, Of the Municipalities of Solita, Curillo and the Department of Putumayo. Beautiful town rich in fishing, livestock, banana, cassava, cacao, and with a great natural forest stint which is refuge for the variable species that live in them. The municipality is part of the Amazon, with a tropical humid climate, therefore its vegetation has a great diversity of plant and animal species, the first stands out the extractive system of timber such as Achapo, Sangre Toro, Sonoro, Marfil, Guamo Cerindo, Tamarindo, Perillo, Comino, Amarillo Real and Laurel; Citrus fruits such as mandarin lemon, orange and lemon, and Amazonian fruits such as Chontaduro and Caimarona grape. Wild animals such as Guaras, Armadillo or Gurre, Boruga, Yulo, Manaos, Venados, Cerrillos, El Paujil, Tente, Pigs and Babillas can be found. By land: you can get to a place by a public or own car. From Florencia it would take you around 4 hours to get there. It can take you more time if the road conditions are not good.